In our family, one of my Mom’s frequent Sunday meals was Old Fashioned Swiss Steak. We lived a block from Church and sometimes walked, and I remember coming home to this Old Fashioned Swiss Steak in the oven. Just the smell when we walked in the door was enough to get our mouths watering! It’s funny but I didn’t remember until now that sometimes our big Siamese Cat would follow us to Church, wait for us and walk home with us! But back to the Swiss Steak. The timing was just right to pop the Old Fashioned Swiss Steak in the oven right before we left and be nearly done when we returned. Long, slow braises are the answer to all kinds of issues. This is really a plain eating old down home recipe. With simple ingredients, and basically no extra spicing, Old Fashioned Swiss Steak really lets the flavor of the food shine through. While newer recipes may use other meats and ingredients in an attempt to improve, I’ve resisted any of these “new-fangled” ideas in this childhood favorite. A little seasoning salt or garlic, maybe, but other cuts of beef or vegetables and a variety of flavorings from herbs to wine would take this to a whole “nuther” level. It would no longer be “Old Fashioned Swiss Steak.” At least not the one I remember. We always had our Old Fashioned Swiss Steak with mashed potatoes. Noodles or rice would probably do, too, *shudders* but mashed are a perfect foil for the tomato “gravy.” For a side? Lima beans. They’re hearty enough to go with all the rest. I don’t know that I was ever “taught” to make Old Fashioned Swiss Steak; I just picked it up. My job, from the time I was old enough to reach the counter standing on a kitchen chair, was to pound the flour into the round steak with the edge of a plate – that’s how the hallmark texture is achieved. You’ll want to pound the steak – a lot. And when you think you’re done pounding, pound a little more. Cube (Minute) Steaks were never used at our house for this dish. I still don’t use the cube steaks. They are uneven in texture and just don’t cook up quite right in this recipe. Pick up a round steak (they’re usually huge) or a round roast and slice it into steaks, then pound as directed. The technique is shown in more detail on my post for German Beef Rouladen with Mushroom Gravy. When shopping for the round steak, you’ll probably find that the roast is going to be a much better bargain and will go on sale more often. It really isn’t difficult at all to slice into pieces. This is basic stuff, but something I had to explain to my son at one time: If you have the money, its better to buy a larger cut that’s less per pound, rather than just looking at the total price, especially if you use the extra for another meal. Shopping at a low is not always intuitive. The Swiss Steak, alone, runs about $5.35, Mashed Potatoes and vegetables are going to up the price of the meal. With careful shopping, dinner can be on the table for under seven bucks. The Classic Swiss Steak from the 50’s & 60’s. Place flour on a large plate and set aside. Cut round steak into serving pieces. Salt & pepper as desired. Dredge steak in flour (really press in well), then use the edge of a sturdy plate to pound the meat. Repeat this pounding process on both sides until the meat is about 1/2 inch thick and noticeably more tender. Add a bit more flour if it becomes sticky. A meat mallet may be used instead, the large pointed side. Heat vegetable oil in a large ovenproof skillet (or Dutch oven) over medium heat; cook the onions & floured beef in the hot oil until the meat is golden brown, turning once. This will likely have to be done in batches, but the onions are best done in the first batch, then left in the pan to slowly brown and color through as the second batch cooks. Return all meat to pan, strew with onions. Strew the bell pepper slices across the top. If you need to layer the meat, make sure each layer contains onion & pepper. Mix tomatoes with salt and pepper, pour over the top. Check the bottom of the pan. Liquid should come up nearly to the top but not over the first layer of meat. Add a little water if needed. Bring to a simmer, cover tightly and place in a 325-degree oven until done, when meat is tender and no longer chewy, but still holding together, about 1 1/4 to 1 1/2 hours. 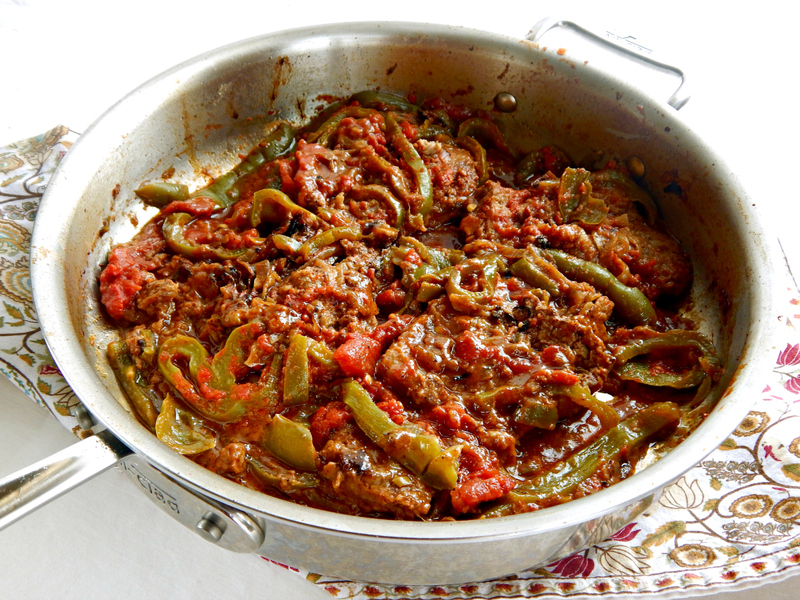 Remove meat, stir sauce and vegetables together and serve with meat. Brown the meat and onions, you might need to do in batches. 1 1/2 hours or so later! Those juices will stir right up to a lovely sauce. This entry was posted in Click here for Bargain Meals, Click here for Fabulous Food Posts and tagged Bargain Meal of the Week, Beef, Bell Peppers, Easy Recipe, Family Recipe, Freezes Well, Frugal Hausfrau, Heritage Recipe, Round Steak, Swiss Steak. Bookmark the permalink. I make it now for my young family (though I will admit that I often use cube steak) but the best results are from the round steak. I love the gravy so much, but do add a bit more flour to the tomatoes so it gets nice and thick while it cooks! Glad to see others enjoying it as well. Lucky you, a meat mallet, lol! And yes, I have one but for some reason mom never did. I think the cube steaks, at least the ones we get here, are kind of iffy. Sometimes they’re nice, sometimes they just kind of fall apart or have holes and the stores only have them now and then. It was fun to hear your comment and shared experience! I adore Swiss Steak. My mother also made it when I was growing up. I now make it in my crock pot, and more recently my Instant Pot. I use crushed tomatoes, and I think the green peppers and onions are very important! Instead of potatoes, I love it with buttery, salted white rice. I haven’t tried it in the oven, but I look forward to trying your recipe on a lazy Sunday at home. Thanks! Hi KT, I’ve been wanting to make it in my very recently acquired instant pot. I seem to be using it mostly for rice and frittatas so far! I made New England Style Baked Beans in it yesterday. I also made some Mexican style pork and bread pudding and corn pudding. So I’m learning! Thanks much! It’s an oldie but a goodie as my Mom would have said!